Auta de Souza, a famous Brazilian poetess, was born in Macaiba on September 12, 1876. She was the only girl among 5 children. Her life was full of trials and difficulties. When she was only 3 years old, her mother died, and when she was 5 her father died. She went to live with her grandparents thatmoved to the city of Recife. Auta de Souza was extraordinarily brilliant. At the age of 7 (1883) she was already capable of reading stories to the poor children and to the slaves. In 1887, her brother Irineu, died as a result of a serious fire, which seems to have led her to constantly refer to death and childhood in her poems. In 1888 she started to study at the School Saint Vincent of Paul, receiving a fine education, especially regarding religious topics. She studied the Gospel deeply. She spoke French fluently, which propitiated her to be in contact with the literary work of her time. Her health was always delicate, and in 1890 she became seriously ill, from an illness that would wind up taking her life. She returned to Macaiba because of a better climate condition for her health. At the age of 17 (1893), her first poems were published in local newspapers and magazines. At the end of 1900, her first and only book, “Horto,” (name of the first poem of the book) was published. Mr. Olavo Bilac, one of the most renowned writers of Brazil, wrote the preface of the book. leaving her physical body behind. 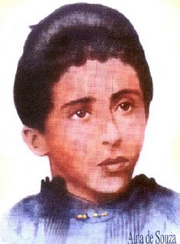 On February 27, 1901, the 24 year-old Auta de Souza died, in the city of Natal-RN. In 1930, Francisco Cândido Xavier received through his mediumship a poem from the young discarnate girl. Dr. Elias Barbosa, describes in his book “In the World of CHICO XAVIER” (2ª Edition – page 19, the first meeting that Chico had with Auta de Souza. “Yes, I remember one sonnet entitled “OUR LADY OF SUFFERING” that, if I am not mistaken regarding the date, was published by the Almanaque de Lembranças, of Lisbon, in 1932. From that year on, with the publication of the Book PARNASSUS OF BEYOND THE GRAVE, in 1931, there are a vast mediumistic production of AUTA OF SOUZA through the hands of Chico Xavier: 89 poems and 27 verses. Excerpted from the letter of Chico Xavier to M. Quintão. Reformador 1932 – nº 8 – April, p 237. Along the dedicate individuals of the Spiritist Arena, Auta de Souza is also present. In 1950, NIMPHO OF PAULA CORRÊA (of the Spiritist Center Disciples of Jesus, de Campo Grande-MS) participated of a campaign called “The Kilo Campaign,” and when he moved to São Paulo in 1952, he joined the FEESP, working together with Mr. Jose Gonçalves Pereira in social assistance. Together they created the CAMPAIGN OF FRATERNITY. From Pedro Leopoldo they received communications of spiritual support, in particular from AUTA OF SOUZA, through a series of poems motivating their work (MIGALHA, ESCUTA, BENDITA SEJAS, DIVIDE, ORAÇÃO DE HOJE, PENSA, SUBLIME ENCONTRO, AOS CARAVANEIROS DO BEM. Because of that, they decided to name the campaign “CAMPAIGN OF FRATERNITY AUTA OF SOUZA,” a famous spiritist movement that started in the city of São Paulo with the objective of collecting food for the poor, of disseminating Spiritism and to enhancing the practice of charity, that has been spread throughout the world. I contemplate your lacerate heart. In a life filled with harshness and ingratitude. That enlightens, guides, and supports. Drops of light in the darkness of anguish. present in the illusory and tempting pleasures. Longing souls of the Celestial Nest! To those who suffer in desperation. In the pathway of light and redemption! God bless your gestures of kindness. Because the world gets better by just seeing you! Charity! You are the gift that bonds us together. of misery which hurts and brings suffering. Do not answer saying ‘ who cares? Will be your prize in the Divine Mansion.